As the first quarter of 2019 nears its close, I wanted to reflect on the history of Criterion and how we have built such a special company. This year is shaping up as something special and it seems appropriate to look back on what brought us here. 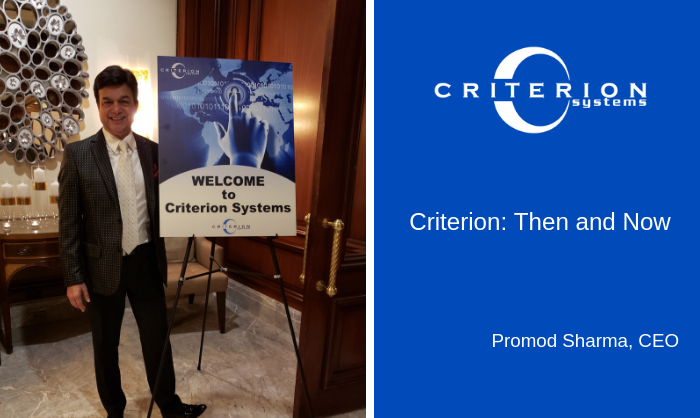 In 2005, I founded Criterion as a federal government contractor with a focus on three agencies: Department of Energy (DOE), Department of Agriculture (USDA), and the Department of Defense (DoD). Today, these agencies are where our company has achieved the most success. We also decided to focus on cybersecurity, a technology with enormous growth potential. Today, two-thirds of Criterion’s revenue comes from this area. In 2018, Criterion was recognized as one of the fastest growing businesses in the DC region, with more than 400% revenue growth over the past four years. Criterion’s trajectory has not been without difficulties. In 2010, Criterion was a subcontractor to a larger firm, having 75 full-time employees (FTEs) on the project. The prime contractor lost that project and, overnight, those 75 people were gone (out of a total of 130 employees at the time). At the same time, some other contracts ended, and Criterion reached a low of 29 billable people. In response to this challenge, believing in our vision, we have stayed the course, adjusting our strategy as needed and getting the wins we’ve needed. Today, the company is as large as it has ever been, standing at about 500 billable people (employees and subcontractors). In 2018, Criterion transitioned from being a small to a large business (as defined by the government for contracting purposes). In preparation for this move, we focused on building our contract backlog and we now have the sustaining power we need to achieve our goals in the free and open competitive space. The key to Criterion’s success is planning: The senior leadership team and I always look ahead 6-12 months, create a roadmap with key milestones, and work hard to execute the plan. We put in place goals that force our teams to stretch but are at the same time measurable and achievable. By knowing exactly what we need to do, we move with purpose through every day and every decision. Criterion’s culture celebrates the combination of outstanding technical skills and an entrepreneurial spirit. Companies are built with people, not desks and chairs, and Criterion takes care of its people, from a well-stocked kitchen, to breakfasts every Friday and a happy hour on the first Monday of the month, which gives me the opportunity to talk with employees at all levels of the organization. All of this makes Criterion a special company and a great place to work. I encourage you to read through our blog, follow our social media channels, and stay tuned for lots of great news throughout the year!